Autumn is a great time to visit Daylesford and Hepburn Springs. Beautiful autumn reds and browns, morning mists hanging in gentle valleys and smoking chimneys – all the ingredients to get cosy and romantic. Visitors can experience quality local restaurants, explore local boutiques and galleries, and…meet some of the area’s most talented artists. If you’ve booked accommodation over a weekend in the first two weeks of May and you’ve been searching for what to do in Daylesford and Hepburn Springs during your visit, you’re in luck. The annual Open Studios is in its fifth year and is not to be missed. Daylesford and Macedon Ranges Open Studios occurs over three weekends and is an opportunity for visitors to experience the breadth and range of talent in the Daylesford area. 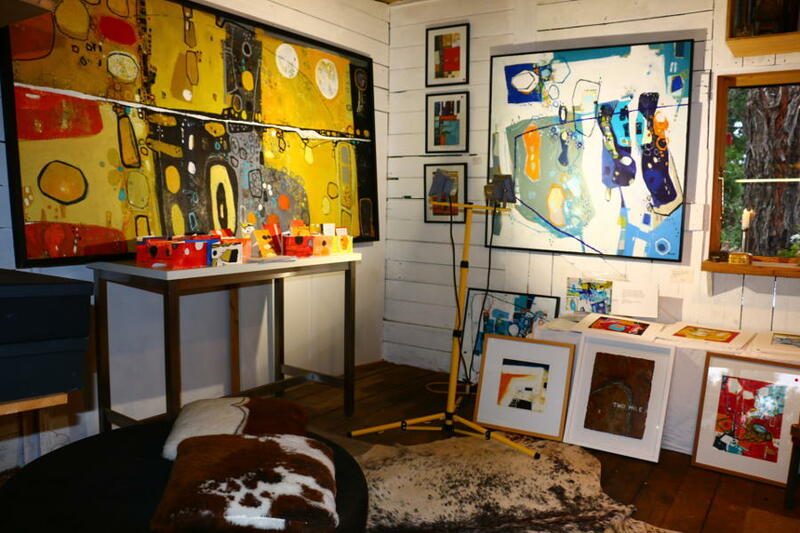 Artists open their homes and studios to show their work, share the ideas and experiences that motivate and inspire them, and give the public an opportunity to purchase their work. We visited only a fraction of the thirty artist’s studios during the first weekend. 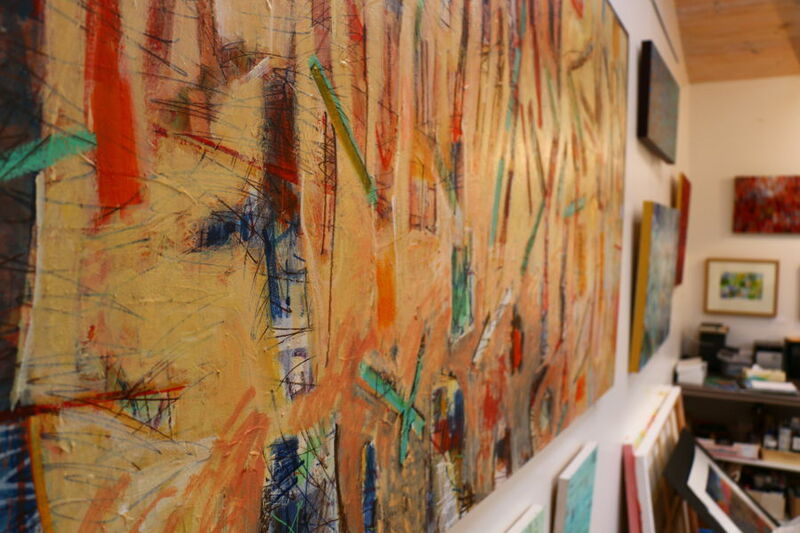 Each meeting provides a different perspective and insight on the artist and the process of creation. All the artists we visited were very welcoming and were happy to chat about their art. We learned something different each time. Below is a short summary of two very different painters and a ceramics collective we visited and highly recommend. Our first visit was to the lovely straw bale home and studio of Helga Hart. Helga’s work is inspired by the natural landscape. Her work includes central Australian landscapes, as well as the local Daylesford terrain. She describes her paintings as a ‘choreography of layered colours, marks and gestures’. I found the more time I spent looking at her paintings, the more vivid the colours, as the deeper layers emerged. Helga’s paintings vary between impressionist and moody landscapes, to more abstract patterns, with scratchings and the surprising addition of gold leaf. Her colours include the reds, ochres and yellows of central Australia and moody blues and greens. She works in watercolour and oils. Helga’s studio looks out onto a beautiful established garden, which will be open to the public as part of the Wombat Hill Open Garden weekend on the last weekend of May. For more information about Helga visit her website. With a turn away from mass production in recent times there is renewed interest in handmade ceramics. 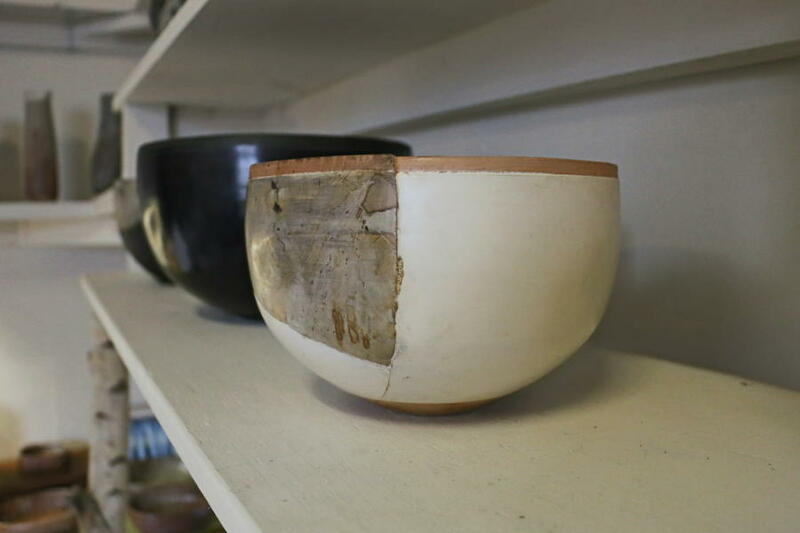 We visited Clayspace, as part of Open Studios and saw some beautiful local ceramics. Clayspace was started by seven women in Daylesford who wanted to create a supportive place for artists to be able to pursue their work and fire their ceramics. This modest studio, warmed by a small wood fire in the corner of the room, shows the work of talented local artists, working in a range of ceramic styles and traditions. Modernist inspired teacups, platters, exquisite Japanese style bowls, innovative firing, and unusual shapes are all on show. Those interested in ceramics won’t be disappointed. Artists on display include the world recognised Petrus Spronk, who created the well known bluestone sculpture of a fragment of the library emerging from the pavement, at the State Library in Melbourne. Other potters include Tania Verdez and Kim Haughie. Greg Mallyon’s studio is not to be missed. His bold, colourful works are inspired by aerial flights across Australia and overseas. Greg has had a number of exhibitions in the USA and Europe and was selected as an artist-in-residence in Barcelona and Venice. 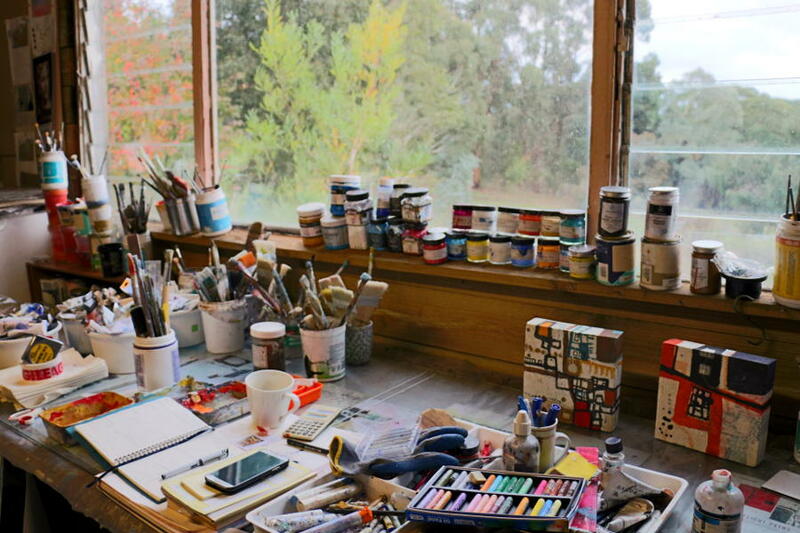 Greg’s spacious studio overlooks a valley of peppermint gums filled with birds and regular visits from kangaroos. We learned about his forthcoming international exhibition and his latest project – his largest painting yet – the facade of a new three storey building in Melbourne’s inner suburbs. For more information about Greg Mallyon, visit his website. If you’ve got a few things to do in Daylesford over your weekend and don’t want to visit thirty locations, you can see all thirty artists in a single location at The Group Exhibition at the Convent Gallery . Visiting the Group Exhibition provides an excuse to see the rest of the Convent Gallery. Explore the many rooms and exhibition spaces of this historic building and art gallery, with Australian and international artists on display. Learn about the history of the convent, meander through the surrounding gardens, and have lunch in the plant filled, bright atrium at Bad Habits Cafe. For more information and a list of the participating artists, visit the Open Studios website and download the guidebook. Open Studios is on 6-7 May and 13-14 May, 10am – 5pm. There are so many things to do in Daylesford in Autumn…or nothing, if that’s more your style. There are also several galleries in Daylesford and the surrounding area, selling a selection of beautiful handmade items. For other ideas of what to do in Daylesford, visit our reviews page, where we provide suggestions and reviews of restaurants, gardens and other places to visit in the area. For beautiful luxury accommodation in the area, why not try Saffron or Horizon at Hepburn Spa Pavilions – two luxury spa villas, located a few metres from the famous Hepburn Mineral Springs Reserve. Kookaburra Ridge is a romantic, art-filled country house a few minutes from Daylesford and Hepburn Springs, where you can enjoy two acres of rustic gardens.